The Glamorous Life of a Housewife: Tamale Pie. I tweeted a picture of our supper the other night and several people requested the recipe. So to appease the masses (or ... um ... the 4), here you go! 1. Brown ground beef and onions until translucent. Add taco seasoning and Rotel and simmer for 10 minutes. 2. Add beans, Fiesta corn, 1/2 can cream corn to the beef mixture. Take off heat, cover and set aside. 3. In medium size bowl, combine corn bread mix, milk, egg, green chiles, sugar and a pinch of salt. Stir until combined. If you need to add a little milk to make it easier to pour, feel free. 4. In a 9X13, spread a thin layer of corn bread mix and pop it in the oven until slightly crusty on top. 5. 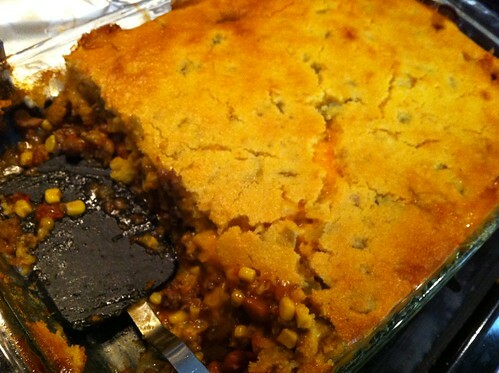 Pour the meat mixture over the corn bread, cover with cheese and pour the remaining corn bread mixture on top. I couldn't believe how much Levi loved this meal. He ate an entire bowl and then a little bit more (and this is huge for my veggie/fruit only loving baby). We will definitely add it to our standards since it is an easy meal that we all enjoy! Oh, and it's just as good warmed up the next day. We ate it for supper two evenings in a row because it made so much! Delish. This sounds really good! I am going to try this. Thanks for the new recipie! I was one of them! HA! THANK YOU SO MUCH! I'm going to try it next time I go to the store!! Just wanted to let you know that I made this tonight and it was AMAZING! The family loved it! Thanks!